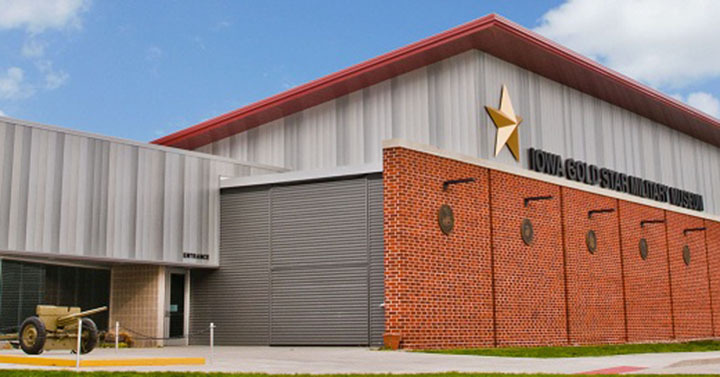 The Iowa Gold Star Military Museum will host its annual Memorial Day observance on Monday, May 25, from 5 a.m. to 1 p.m. at the museum on Camp Dodge Joint Maneuver Training Center, 7105 NW 70th Ave., Johnston. A complimentary “S.O.S.” (“Stuff on a Shingle”) breakfast will be served at the historic Camp Dodge Pool Pavilion directly east of the museum from 6 to 9 a.m., or until supplies run out of the genuine military recipe of sausage gravy on toast. Fresh “Army” coffee, “Bug Juice” (orange drink), and granola bars will also be served with breakfast. There will be vintage and modern military vehicles and equipment on display, re-enactors from the Civil War, World War I and II, Korean War, and Vietnam War, and a vintage military aircraft flyover. Visitors can enter Camp Dodge through either the main gate at 7100 NW 70th Ave., Johnston or the historic East Gate at 7700 NW Beaver Drive, Johnston. Photo identification (a driver’s license is acceptable) is required for admittance to Camp Dodge for individuals 16 years of age and older. Note that ALL motorcyclists (drivers and passengers) on Camp Dodge are required by Dept. of Defense policy to wear Personal Protective Equipment consisting of helmet, eye protection (full-face shield or goggles or sunglasses), gloves, long pants, long-sleeved shirt or jacket, and over-the-ankle footwear while traveling on Camp Dodge. Motorcyclists without the required PPE may park their motorcycles at the NW Beaver Drive gate turnaround and walk to the museum (approximately three blocks).